In a few weeks, my kids will head back to the living room to resume their educations. They’ll get up at the crack of 9:30, stumble down the stairs, and fill their minds with knowledge. How to stand in line. From the first trip to the bathroom in kindergarten, we learned how to line up. We lined up to go everywhere–to the bathroom, to lunch, to recess, to gym class, to the bus. We spent six years lining up. That skill has served me no purpose in my adult years. But, you object, there are plenty of places you have to stand in line–the grocery store, the DMV, the amusement park. While this is true, most of these places assume you’ve forgotten how to make a line, because they’ve set up ropes/chains/fences that automatically funnel you into line. Can you imagine your boss coming around every Tuesday and yelling, “OK, everybody. Line up! Let’s walk into the conference room for the staff meeting. And Jim, keep your hands to yourself, or you’ll have to attend mandatory sexual harrassment training seminars.” That would be so… weird. Lining up = completely useless. Handwriting. They say how you form your letters is set in stone from an early age. Hogwash. I got bored in college and completely changed my writing style. Twice. And like Tiger Woods’ ever-changing golf swing, I sometimes ended up outside the lines and it wasn’t very good. It looks like I learned penmanship from a drunk epileptic chicken. With the invention of the smartphone, everybody types or texts now. So handwriting is completely outdated. Which is good for me, because I can’t read my own anyway. Pull ups. Remember those Presidential fitness tests we all failed every year? I hated those things. The 600 yard dash put some of us in cardiac arrest. Someone always farted during sit-ups. And pull ups were every guy’s nightmare. The future athletes could eek out two or three. But guys like me? We couldn’t pull up anything except our pants after taking a whiz. In my nearly 38 years on planet earth, I’ve never done a pull up. I don’t expect I ever will. And I really don’t think Ronald Reagan really cared if I could do one or not. He was too busy with Iran Contra. Shakespeare. OK, ol’ Bill was pretty cool once the creepy English teacher showed you how much of a perv the Bard was. But when did I last need Shakespeare? To pass senior year AP English. With all the useless book reports I had to write, you’d think I was a Shakespeare expert. Of course, I can’t remember a single thing about Shakespeare. I guess it was all Much Ado About Nothing (okay maybe I remember one thing). Kids these days can buy book report papers online, and I can’t lie, I’d do the same if I was them. To be fair, the only time I think that English is necessary is when you have to know how to speak and write it. That’s why it would be much better to have a teacher who can teach you this. There are some people out there who are good teachers. For example, AJ Hoge is a leading English teacher when it comes to teaching people how to speak and write English. Career Track. In middle school, the guidance counselor gave us a test. The results showed us our interests (like we didn’t already know) and gave us several career options, complete with job descriptions and salary ranges. Mine suggested that I play in a symphony. Which would be cool if, say, John Williams were directing me for the Star Wars score. But I was ten years too late for that. Career Track, you were so wrong. Chemistry. Yeah, Breaking Bad made chemistry cool in a depraved, illegal sort of way. But that came fifteen years too late for me. Balancing chemical equations didn’t help me, or anyone else, get a date to the prom. Heck, it sure didn’t help that our chemistry teacher threw up his hands when he couldn’t figure out how to balance one particular equation and yell, “I’m a biology teacher, not a chemistry teacher!” The only chemicals I cared about mixing back then were chocolate syrup and milk. Today, it’s an occassional Coke with a splash of cherry rum. And I didn’t need a year-long class to learn those vital life skills. Maybe I would have been more interested in chemistry if I actually understood it better. Nowadays, it’s so much easier to give yourself that extra bit of help. You can just go online and look up something like chemistry homework help and you’d be sorted. How to do my taxes. On second thought, scratch that. I don’t mind paying someone for the convenience. How to parallel park. My driver’s ed teacher, on the day we were supposed to learn to parallel park, said, “The car’s broke. If you have any questions, come see me in the fall. I gotta go to the golf course.” To this day I would park a unicycle ten miles away over parallel parking. That’s right–in twenty-two years of driving, I’ve never once parallel parked. Ok, maybe I’ve exaggerated a little (a lot). I suppose I use a lot of stuff everyday that’s related to the K-12 education I received. Typing sure has helped. History and civics? Pretty useful come election time. And algebra has saved my life more times than I can count (not really). And skills like reading, writing, math (that doesn’t include adding and subtracting letters), and the countless other things that nurtured and matured my warped little mind have all contributed in priceless ways to my career, relationships, and life. And speaking of life–as valuable as our schoolin’ is, I learned the most from the school of life. He’s the best teacher of all. 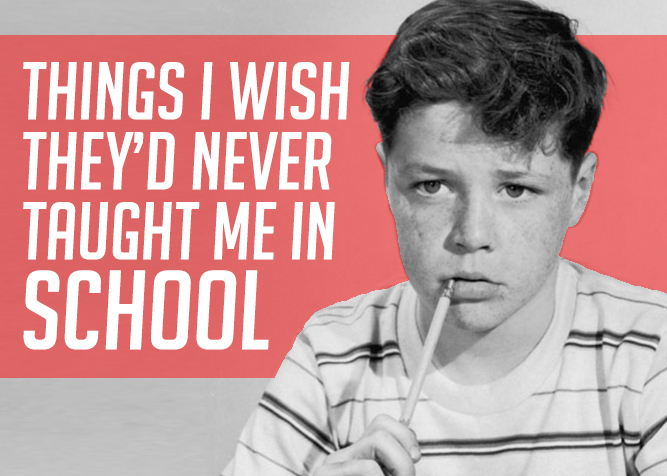 So tell us: what are the most useful things you learned in school? What are some things you wish you could forget? What are some completely useless things you learned that have added zero value to your life since becoming an adult? Having ADHD and now working with ADHD families I am acutely aware of how inadequate our schooling was and still is. (I finished in 1972). If you were very good or very bad you got noticed. I had no idea why I did maths and for the most part I learned by rote. Children are not taught to think and make decisions so that they are employable and not employed. Having said all that I made the most wonderful friends and 40+ years later we still get together. So it had its good points.